Zuora, the leading subscription billing platform, filed for a $100M IPO with Goldman Sachs leading the offering. The company will trade under the ticker “ZUO” on the New York Stock Exchange. Zuora is the 3rd software IPO to file in 2018, with Dropbox and Zscaler both a few weeks ago. Zuora was founded in 2006 with the mission to “enable any company in any industry to successfully launch, manage, and transform into a subscription business”. Zuora actually coined the phrase “Subscription Economy” and is benefiting from the trend of companies and consumers moving towards subscription models — Salesforce.com, Uber/Lyft, Netflix, AWS, etc. As businesses move their products and services to subscription models, they need a software platform to help manage their billing systems, like Zuora. Zuora did $168M of total revenue in FY’18 (ending Jan 31), up 49% YoY. The company has actually accelerated their revenue growth from 23% the year before, with much of that growth coming from an increase in professional services revenue. 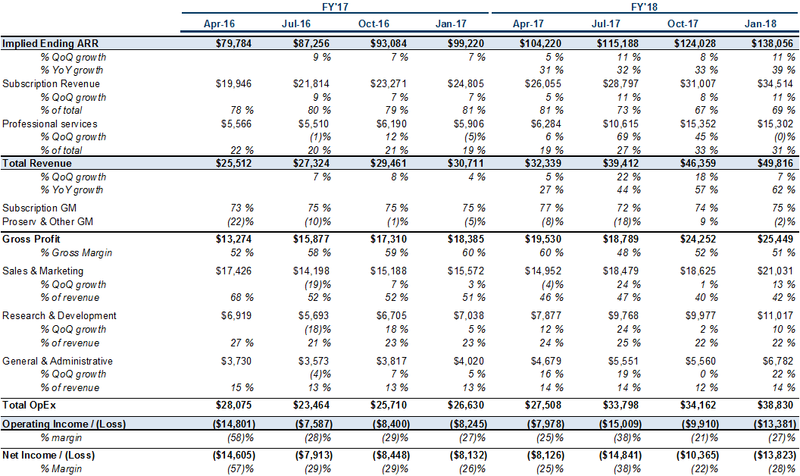 In terms of an implied ARR figure (annual recurring revenue), they ended FY’18 at $138M, up 39% from $99M in FY’17. 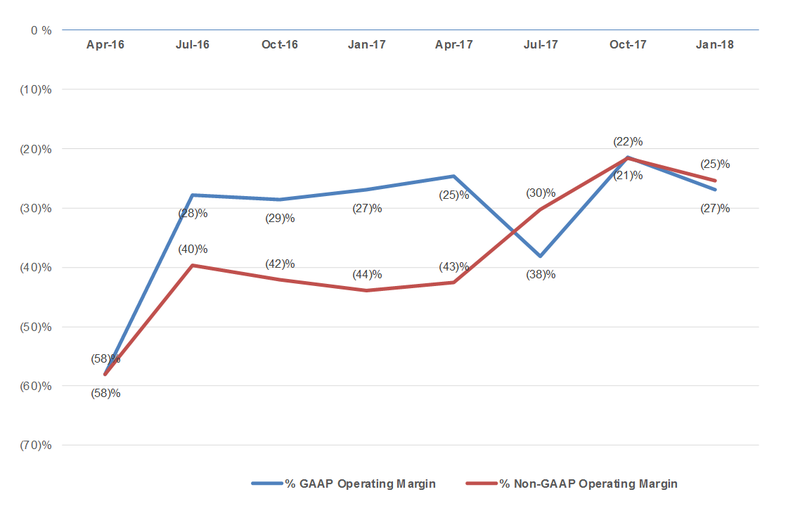 On a GAAP and non-GAAP basis, Zuora is still losing money and had a (28)% GAAP operating margin in FY’18, an improvement from (35)% and (52)% in FY’17 and FY’16, respectively. Zuora does have significant professional services revenue and their selling processes can be “lengthy and complex”; their pro-serv engagements typically last between 3 and 12 months. 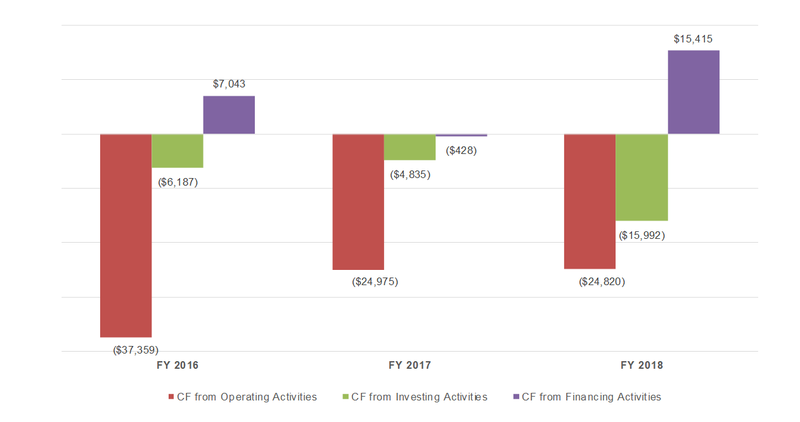 Although once the solution is deployed, it does become mission-critical and is very sticky — excluding churn from acquisitions, the company has only lost 1 customer in the past 3 fiscal years who had an initial ACV of $100K+ and that has gone through a renewal cycle. Zuora’s platform consists of 3 main components; Zuora Central Platform, order-to-cash products, and an application marketplace. Zuora Central Platform: Core of Zuora’s offering and is comprised of 6 core “engines” or modules that include a pricing engine, subscription ordering engine, rating engine, payments engine, subscription metrics engine, and a subscription accounting engine. In terms of order-to-cash products, they offer Zuora Billing (core subscription billing product), Zuora RevPro (revenue recognition automation that came from their acquisition of Leeyo), Zuora CPQ (configure/quoting software), Zuora Insights (subscription data and metrics created from their acquisition of Frontleaf), and Zuora Collect (product to streamline collection processes). Zuora Connect Marketplace; Zuora’s application marketplace offers 3rd party, industry-specific apps that help extend the company’s capabilities to customers. They have over 80 apps and features from over 50 partners. The company has fixed and variable pricing components and contracts typically range from 1 to 3 years. Zuora charges an annual fixed platform fee ranging from $25K — $500K+, depending on the version and functionality. They also charge volume fees based on anticipated usage of the products they offer, which are committed. The volume fees are based on the posted invoice volumes for the Zuora Billing product and annual revenue volume for Zuora RevPro (formerly Leeyo, which was acquired for $35M in May 2017). The company primarily sells through an enterprise and direct field sales force. For comparison, you can see how Zuora stacks up to other IPOs for ARR, net dollar retention, contract sizes and cash consumption. Zuora has $48M in cash. The company is based in San Mateo, California, and has 933 FTEs (full-time employees). Given the growth of subscription businesses (and not only SaaS companies), Zuora does have significant tailwinds in their market. According to MGI Research, the market for their core products in billing and revenue recognition was ~$2B in 2017 and is expected to grow to $9.1B by 2022, growing at a 35% CAGR. The company also thinks they can take share from the ERP software market, which is expected to reach $40.6B by 2021, according to Gartner. Zuora competes in 3 main categories 1) traditional large ERP vendors like Oracle and SAP 2) other order-to-cash solutions that address pieces of their product; for example, Apttus and Salesforce (SteelBrick) in the CPQ market or mid-market ERP vendors like Sage, and 3) other systems like Amdocs and in-house built systems. Given Zuora’s average subscription ACV was $142K this past quarter, they are certainly focused more up-market in enterprise-size companies. Zuora has raised $250M to date from investors including Benchmark, Shasta, Redpoint, Greylock, Index, Tenaya, Blackrock, Wellington, Vulcan, and others. 5%+ pre-offering VC shareholders include Benchmark (11.1%), Wellington (9.4%), Shasta (8.3%), Tenaya (6.6%) and Redpoint Omega (6.5%). The CEO and co-founder, Tien Tzuo, is at a 10.2% pre-offering ownership stake. Zuora’s last round was at a $623M pre-money valuation according to Pitchbook ($115M series F round led by Blackrock in March-2015). 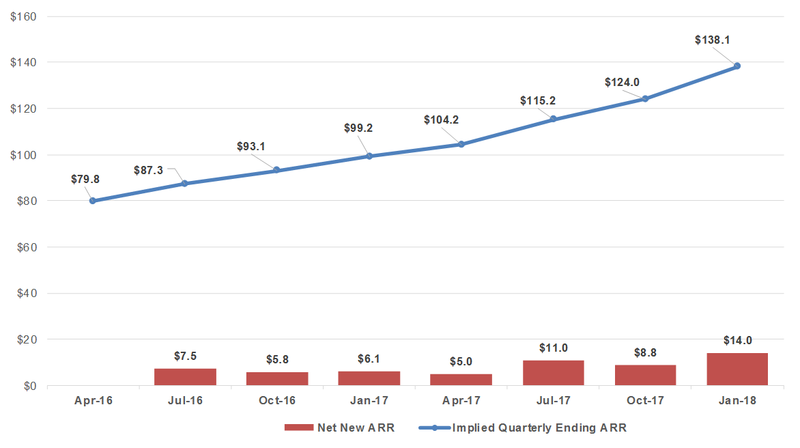 Zuora is at $138M of ARR, which grew 39% YoY and overall margins have been improving slightly and ARR growth has accelerated. Total revenue grew 62% YoY last quarter, which is up from 57%, 44%, and 27% in the preceding 3 quarters YoY, respectively. 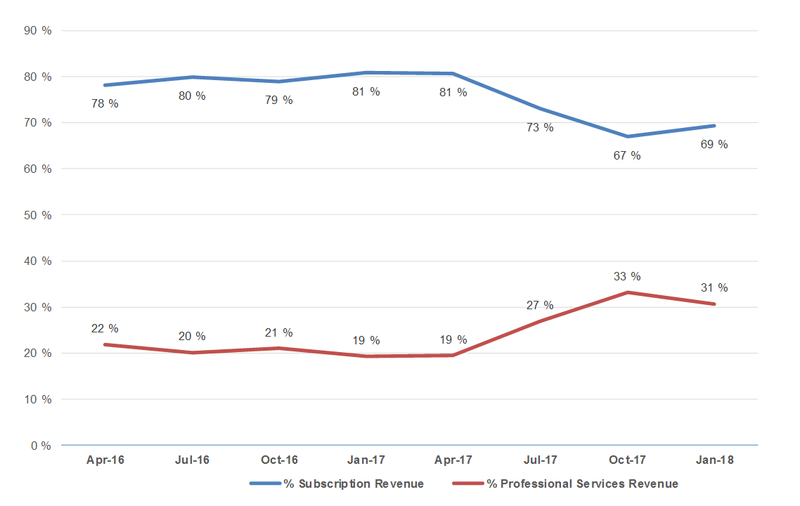 Though, much of their total revenue growth was driven by a significant increase in professional services revenue (which has since stabilized). This is likely helping the company get their product installed faster, where they see nice cohort growth over time. Zuora’s ARR growth has actually steadily increased quarter-over-quarter for the past year. The company has added $38.8M of net new ARR in the last 12 months. 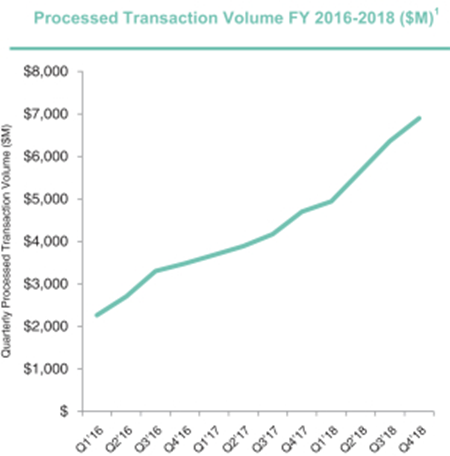 Given Zuora grows with their customer base, their processed transaction volume has been growing consistently. Zuora’s customer acquisition is expensive and they have longer implementation times given the complexity of the product, but once it’s installed their customers grow nicely. 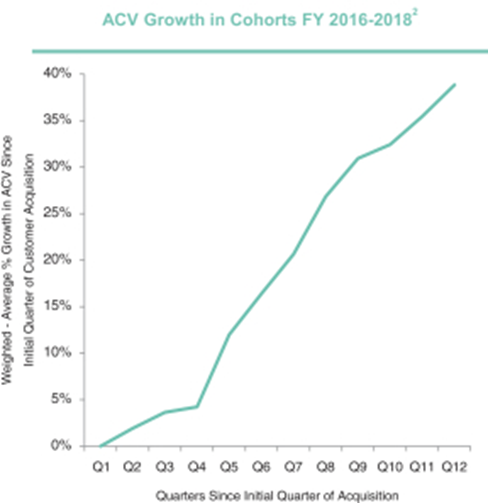 The chart below shows the FY’16, FY’17 and FY’18 cohorts of customers that are $100K+ in ACV. On a dollar-weighted average basis, they grow only 4% the first year, 27% the second year and then 39% by year three. 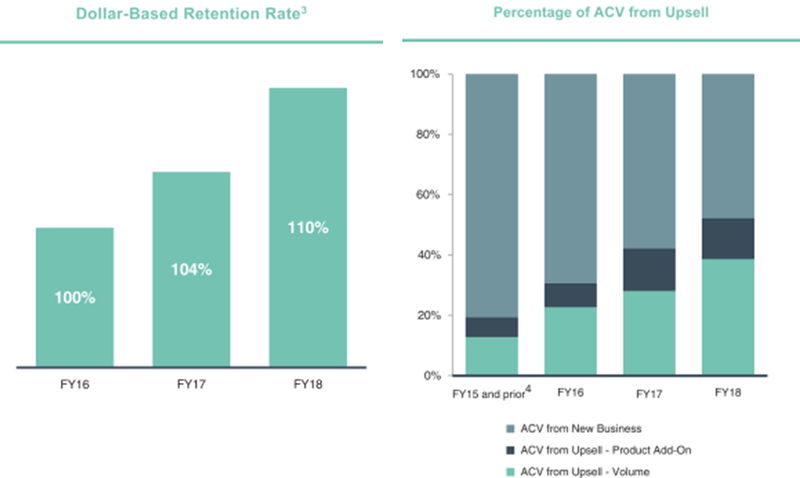 Clearly, Zuora has made it a focus to move further up market — they have increased their average subscription ACVs, total customers at $100K or more in ACV, their dollar-based retention rate, % of ACV from upsell, and % professional services revenue. 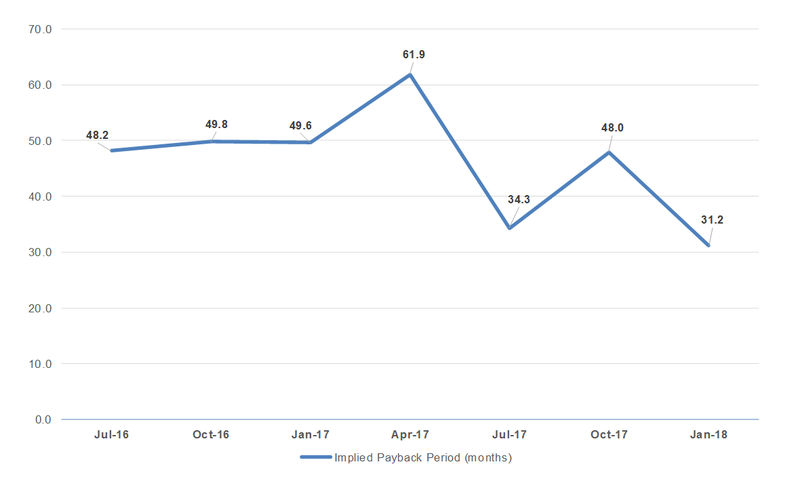 Zuora discloses a “Recurring Profit Margin” metric which is a non-GAAP margin that represents the difference between subscription revenue and recurring expenses. As you can see the margin has been stable over the past few years at ~28–30%. 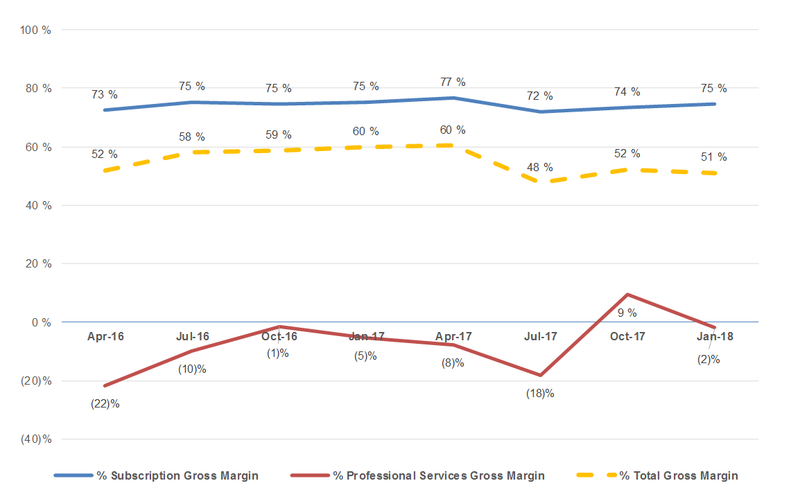 Given the increase in professional services revenue, which is break-even to negative on a gross margin-basis, Zuora’s total gross margin has been dragged down over the past year. This has hurt their sales efficiency. 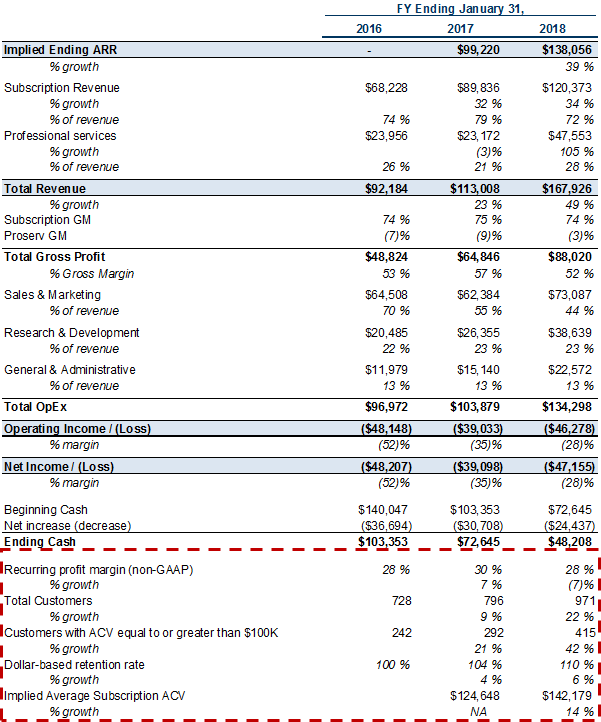 As with other high-growth software businesses that are still losing money, Zuora is likely to trade on an EV / Revenue multiple (enterprise value / revenue). 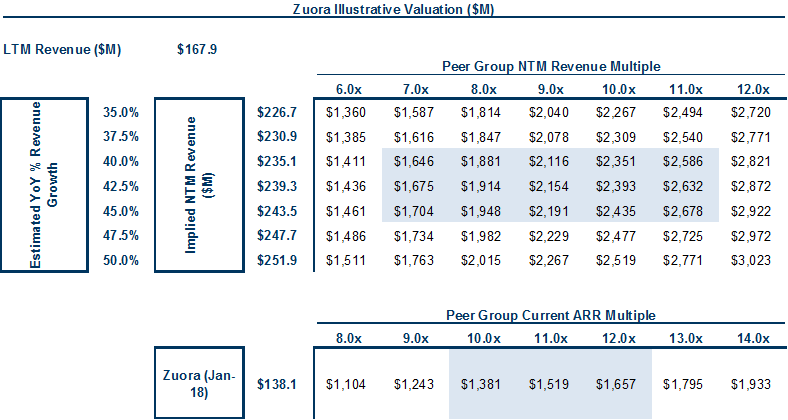 Using public, high-growth SaaS companies as a peer group and assuming a simple range for Zuora’s forward revenue growth, we can see an illustrative valuation range. I’ve also included a peer group ARR range. Given the significant professional services revenue, there might be a valuation discount on a total revenue multiple. There is a delta between the NTM revenue table (which is the company’s total revenue) and the ARR multiple table (which focuses just on subscription revenue). I think Zuora is more likely to price/trade in between those ranges. There are significant tailwinds in Zuora’s market with the growth in subscription businesses of all kinds, and the company has made a concerted effort to move up market to larger customers (along with the fact that their business model enables them to grow with their customer base). While on a short-term basis it might depress unit economics, Zuora’s overall revenue growth is accelerating. I imagine the company has a credible path to increased margins and eventual profitability, which is likely going to be a question for public market investors. With that said, investors will certainly like the accelerating growth and early signs of margin leverage. 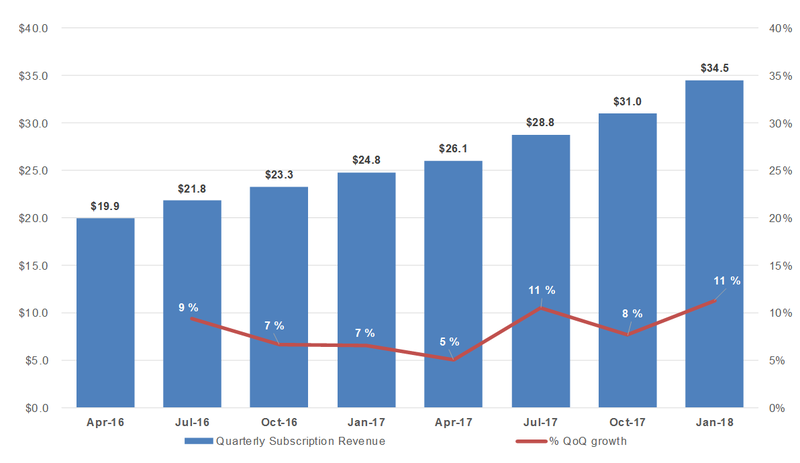 Zuora was founded in 2006 and while early to the subscription billing market, they’re a market leader and increasing growth quarter-over-quarter. Congrats to the Zuora team and looking forward to seeing them trade as a public company. To receive these posts by email, click here. To see how Zuora stacks up to other SaaS/cloud IPOs, click here.